We will be using the dive tables above for the following instructions on how to use Scuba Diving Dive Tables. The example will be for two dives in one day. Step 1 – Start with the top table first. Choose the total depth of the dive. For the example, we will use 80 feet. Step 2 – Now we go across from 80 feet and choose your total bottom time for the dive. We shall choose 25 minutes. Step 3 – Now follow the column down to the next table and see what letter group your dive will be in. In the example, this would be “F”. Step 4 – Now follow the “F” column down until you find the time your plan to wait between dives. Then move over to the left and see what letter group you are now in. For the example, we will wait for 1:30 (hr: min), which puts us at the letter “D”. 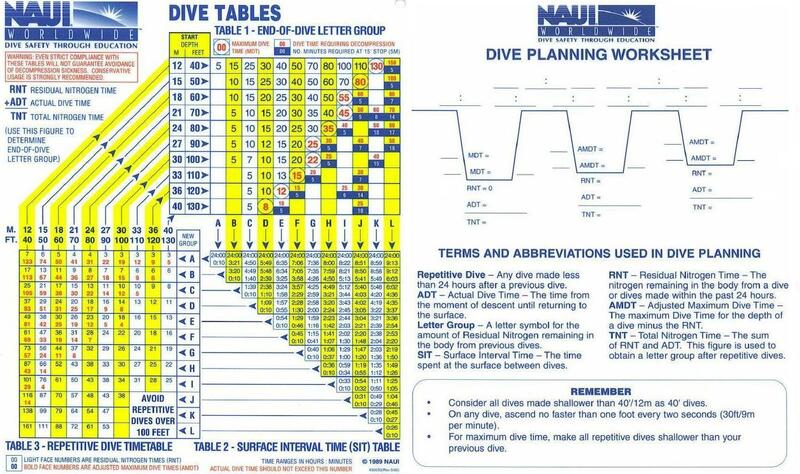 Step 5 – Now you choose the depth of the next dive and this table will tell what your maximum bottom time is. In our example, we shall be doing a dive to 60 feet, which means a maximum bottom time of 31 minutes is allowed without decompression. And that’s how you plan two dives in one day. In the first table, the numbers in circles are the maximum bottom time for that depth and the numbers that are after them are your decompression dive times. To learn more about how these numbers are calculated, take a look at this article on the Science behind Scuba Diving. Very interesting, and important information on Dive Tables. This vital information will ensure safety, and enjoyment of the diving experience. I will bookmark this info for reference in the future. Thanks for sharing.